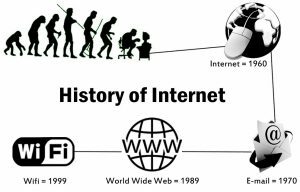 The history of the Internet can be best presented through a timeline of events which shaped the history of humankind and made today look the way it is. Many things that we now take as granted were at some point a great technological development, and in this short history of World Wide Web, it is necessary to point out many things which caused an extreme and rapid growth on the field. You may be a part of history and not even anticipate it. March 12: Tim Berners-Lee proposed a “distributed information system” meant to help researchers deal with huge amounts of information generated by complex physics experiments. December 20: The first website published at Info.cern.ch. August 6: The World Wide Web is publicly launched with Berners-Lee details of the project. April 30: Cern presents the World Wide Web source code and claims it will be free. July 16: Jeff Bezos presents Amazon.com, an online bookshop managed from computers in his garage in Seattle, Washington. Today it is the world’s largest online retailer. August 16: Microsoft´s first version of Internet Explorer web browser. September 15: Larry Page and Sergey Brin register Google.com as a web domain. March: Virgin introduces high-speed broadband internet connections to the UK. February: Harvard student Mark Zuckerberg launches Facebook to connect students at the University. November: YouTube, a video-hosting website is launched. Today, 100 hours of footage is uploaded every minute. March: Twitter Inc is developed by Jack Dorsey, Evan Williams, Biz Stone and Noah Glass. The first tweet was sent on March 21. January 9: The iPhone is launched. July 10: Apple presents the App Store. April 23: Apple introduces the world´s first tablet – the iPad. April: Instagram was sold to Facebook for 1 billion dollars. February 20: Facebook buys a mobile phone messaging system WhatsApp for 19 billion US dollars. April: A coding error discovered in OpenSSL, encryption software which guarantees transactions between a computer and a remote secure. This error makes users vulnerable to having their usernames, passwords, and personal information was stolen. September 26: Mark Zuckerberg speaks at the 70th annual U.N. General Assembly session, to increase awareness and garner support for the initiative One which is an organization that is trying to end extreme poverty and preventable disease. December 14: Yahoo announced that 1 billion Yahoo accounts were hacked in August 2013 before it was acquired by Verizon.